A civil lawsuit following a Boston bike accident is a case designed to obtain compensation for a plaintiff with respect to any injuries suffered as a result of defendant’s negligence. In many cases, civil defendants who are at fault in causing an accident will be given a civil motor vehicle infraction, but will not be charged with a crime. In some cases, where there are allegations of operation to endanger or drunk driving, there will be criminal charges filed in addition to any civil personal injury lawsuit. These criminal cases, or the lack thereof, do not control a subsequent civil case, but they may have an effect on the outcome. According to a recent news article from the Boston Globe, a group of bike safety advocates in Boston are blaming the driver of a truck for his alleged involvement in a fatal bike crash, but prosecutors are declining to file criminal charges. This fatal Boston bike crash occurred in 2015. Prosecutors and police have said they believe the Boston bike rider who died in this accident was at-fault, and thus no criminal charges are warranted.The accident essentially occurred when a truck driver made a right lane at an intersection and failed to see victim to the right of his truck before turning. When the truck made the right turn, the bike rider was run over by the rear wheels of the truck and killed. As our Boston bike accident attorneys can explain, these types of accidents are very common though not all result in death of a rider. As we have discussed in another entry on this blog, crashes involving right turns are among the leading cause of fatal Boston bike crashes. While the way in which the rider was hit and killed by the truck are not in dispute, bike advocates argue blame should fall on the truck driver. Their reason is the truck driver should have seen the bike pass when it passed it and had reason to know the bike rider was to his right at the intersection even though he may have been in the truck driver’s blind spot. The advocates also argue under Massachusetts law, this bike rider had a right to be in the right lane at the time of the fatal Boston bike crash. Pursuant to Chapter 90, Section 14 of the Massachusetts General Laws (M.G.L. ), a driver is prohibited from making a right turn after passing a bike rider unless he or she can make the turn at a distance safely clear of the bike rider at a proper and reasonable speed. While there was no finding truck driver was speeding, bike advocates contend video footage from traffic camera’s show truck overtaking the bike rider and then making a turn and hit and killed the rider. Prosecutors on the other hand state driver was not intoxicated, was not speeding, did not fail to signal, and did not fail to observe a known risk. The police also noted in their report bike rider was in a bike lane to the right of the truck at the time of his death. While this has not been established as a matter of law, the cause of the accident is still very much in dispute, a prosecutor has discretion on whether or not to file criminal charges and in this case, they are declining to file charges. In some cases, it is not a question of whether a defendant is factually innocent or guilty, but rather the chances prosecutors think they have of winning the case. However, whether or not a prosecutor charges a defendant or not does not mean a potential plaintiff should be restricted from filing a civil personal injury lawsuit following a Boston bike crash. A criminal prosecutor may decline to prosecute a case because they think a potential defendant is not guilty, or because they feel they cannot prove it beyond a reasonable doubt as discussed above. This is because burden of proof in a case which can deprive a convicted of defendant of life an liberty (freedom) must be proven beyond a reasonable doubt. This is the highest burden under our legal system and requires jurors to know in their hearts to a reasonable and moral certainty defendant is guilty. In our state, the verdict must be unanimous. In a civil case, it must be established defendant was more negligent than plaintiff, even if only by one percent. This means plaintiff could be partially negligent and still collect an award from a defendant or his insurance company. In the case of a truck driver, an employer would also likely be named under the doctrine of respondeat superior unless defendant was an owner-operator of a truck in which he or she was driving when the accident occurred. This article also discusses the issue of bike safety and the need for bike lanes that are clearly-market with physical barriers separating them lanes of travel to prevent these types of accidents. It is also a good idea in many cases to put these bike lanes on the left side of a travel lane to further prevent the likelihood of a right turn truck crash. 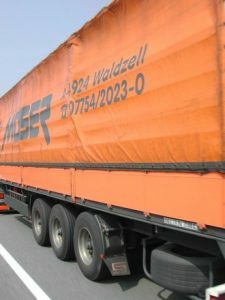 Another thing which can be done to prevent the level damage done in these trunk accidents is for trucks to be outfitted with side under-ride guards. These are physical barriers to prevent a bike rider or pedestrian from getting run over by the rear tire of a vehicle. According to the Federal Motor Carrier Safety Administration (FMCSA), studies in Europe have show side guards have reduced bicyclist fatalities by 61 percent and pedestrian deaths by 20 percent in cases involving truck accidents.